They say MMA is exciting because anything can happen -- and it's true. Click on 'watch fight' to view fights on UFC.tv - UFC Fight Library subscribers can view for free! They say MMA is exciting because anything can happen -- and it's true. A dominant performance can be instantly undone by a simple mistake; a seemingly hopeless underdog can still twist out a win in the final seconds of a fight. Perhaps the most famous comeback in UFC history is Matt Hughes over Frank Trigg at UFC 52 for the Welterweight Championship. Minutes into the first round, Hughes was in worst case scenario mode with Trigg on his back trying to secure a rear naked choke. Hughes did not give up and amazingly reversed the position mere seconds later. Hughes sunk in a choke of his own and retained his belt. 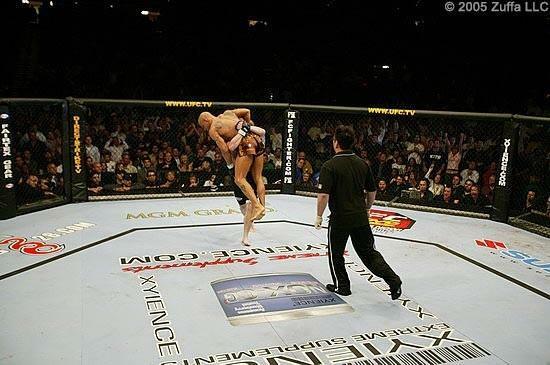 Performances like these make champions and one day UFC Hall of Famers. And crowd-pleasing come-from-behind victories aren't just one-in-a-million events -- they happen every few fights. Here are 11 great jaw-dropping, odds-defying, crazy comeback wins in recent UFC history. 1. Paulo Thiago vs. Josh Koscheck, UFC 95 - Paulo Thiago's debut in the Octagon was greeted by three minutes and change of Josh Koscheck trying to knock his head off. "Kos" stalked Thiago with his trademark loaded up right hand that three months earlier had rendered Yoshiyuki Yoshida unconscious. Thiago ducked and dodged that fist missile for nearly three and half minutes before he countered Koscheck suddenly with an uppercut followed by a fight ending left hook. Not a bad way to start a UFC career. 2. Terry Martin vs. Chris Leben, UFC Fight Night 11 - Every UFC fan predicted a brutal knockout finish from a big puncher match-up like Chris Leben and Terry Martin. After 10 minutes of action, the duo were still on their feet slugging it out. Both fighters were gassed from two rounds of throwing power punches and absorbing their punishment. Martin landed a series of blows that staggered the hard headed Leben. It looked as if Martin only needed to land a few more big wallops to finish "The Crippler" for good. With just over a minute left in the final round, Martin made the mistake of dropping his guard to taunt Leben. That moment was all "The Crippler" needed to set-up a quality counter and KO the brazen Martin. 5. Minotauro Nogueira vs. Heath Herring III, UFC 73 - Former PRIDE Heavyweight Champion Antonio Rodrigo Nogueira was famous for two things: submission victories and an iron chin. No one could have expected in Nogueira's UFC debut that Heath Herring would almost knock him out via high kick. In what seemed like a nightmare to "Big Nog" fans, for the first time against an opponent not named Fedor or Henderson, it appeared like Nogueira was going to get beaten. Herring hesitated with his next attack just enough for Nogueira to shake the cobwebs loose. Nogueira survived that first round calamity and came back in the second and third focused. Nogueira out fought Herring on the ground and standing the other two rounds, keeping his winning streak against Herring unmarked. 6. Jeremy Stephens vs. Rafael dos Anjos, UFC 91 - If only fights lasted two rounds instead of three rounds in the UFC. If only punching wasn't allowed in the UFC. These were the thoughts running through Rafael dos Anjos' head the nanosecond before Jeremy Stephens nearly uppercutted it off 39 seconds into the third round. For two rounds, these two young lightweights fought a fast paced grappling match in favor of the Brazilian. Dos Anjos showed off his superior takedowns, Brazilian Jiu-Jitsu and overall ground game, which quelled all of Stephens' electric stand-up. Coming out for the third round, "Lil' Heathen" knew only a knockout could secure him a win and he did just that. With nothing to lose, Stephens loaded up a fight ending uppercut that when fired off landed perfectly. That punch won Stephens the fight and "Knockout of the Night" honors. 9. Todd Duffee vs. Mike Russow, UFC 114 - In his first fight since setting the record for fastest-ever knockout in the UFC, Todd Duffee entered the Octagon escorted by his corner and seven mountains of hype. He spent the first two rounds showing off that devastating power against a seemingly iron-jawed Mike Russow, whose grappling prowess was ineffective against the gargantuan Duffee. Although Duffee gassed, Russow was further crippled by a broken arm, and it appeared that the crowd would have to wait the full fifteen minutes for the unanimous decision... until an over-the-top right halfway through the third round sent Duffee careening toward the canvas, out cold.